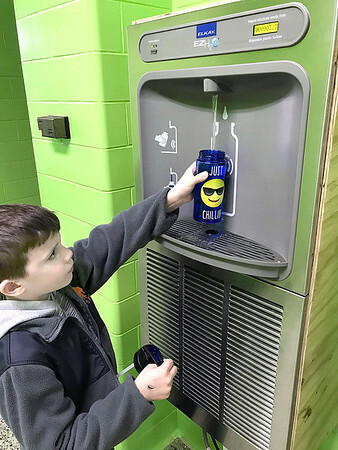 Emerson Elementary student Matthew Morgan fills his water bottle up with an automatic water fountain. The school has three fountains. The fountain uses hands-free sensors to turn the water flow on and off, cutting down on the spread of germs and saving the disposal of plastic water bottles in the landfill. In the short period of time the new fountains have been installed, this fountain has limited the disposal of 327 plastic water bottles into the trash.